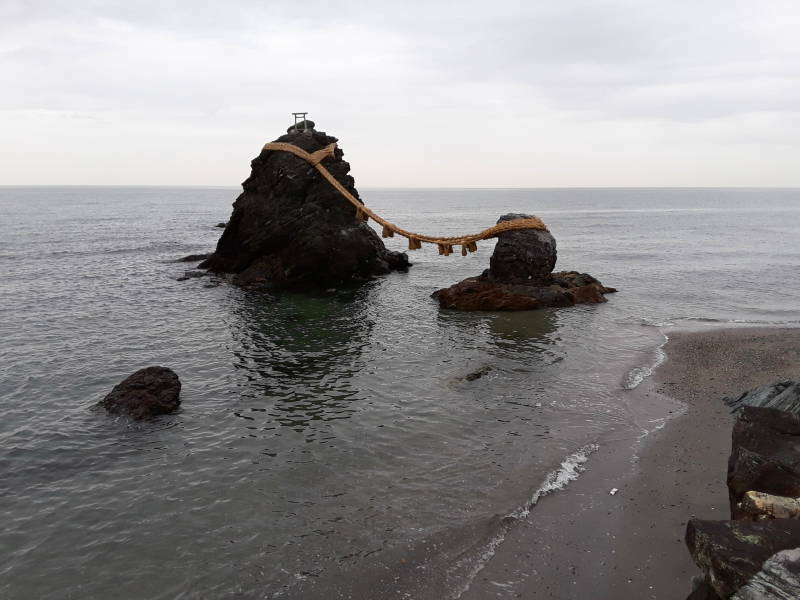 The Married Couple Rocks, known as Meoto Iwa in Japanese, are a pair of small rocky stacks along the coastline near Ise. They're joined by a heavy rope made of rice straw, which is replaced several times a year in a special ceremony. 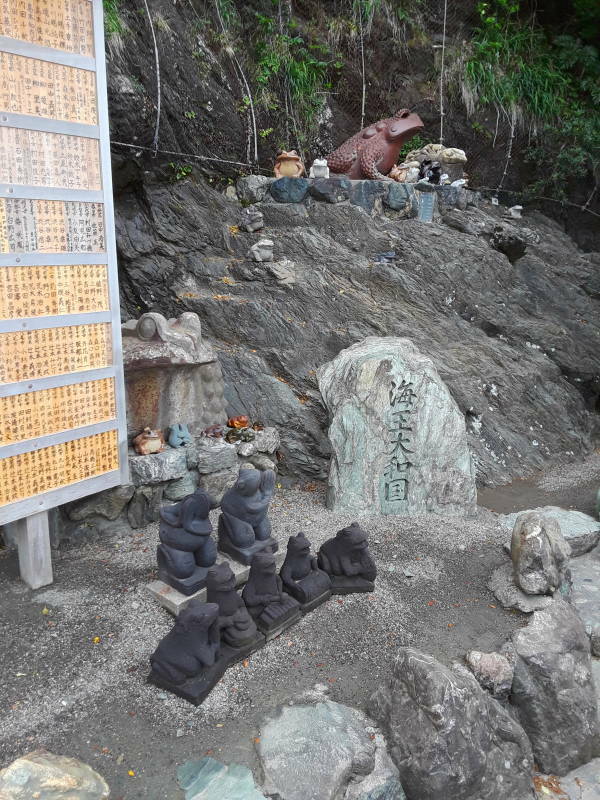 The rocks represent Izanagi and Izanami, creator deities of Shintō cosmology. 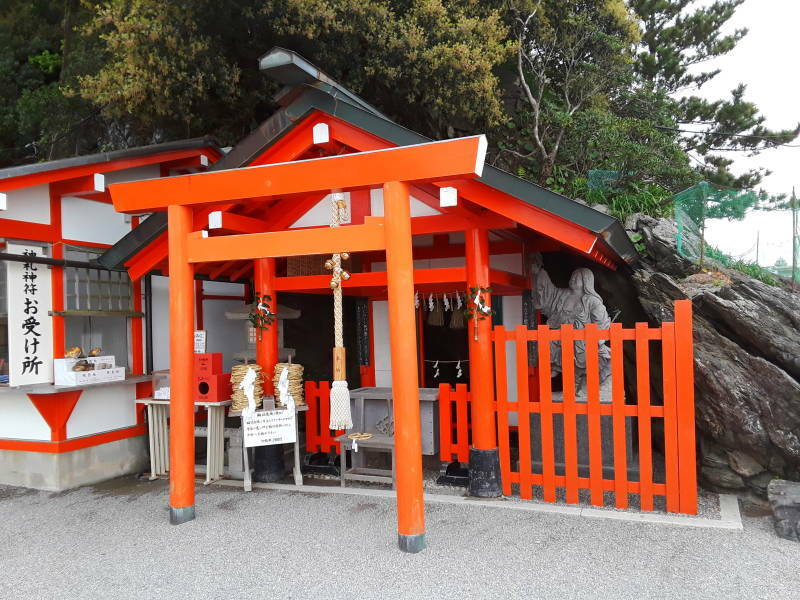 They're just a short distance from the Grand Shrine, the principal shrine of Shintō, where the sun goddess Amaterasu is believed to be enshrined, or housed. 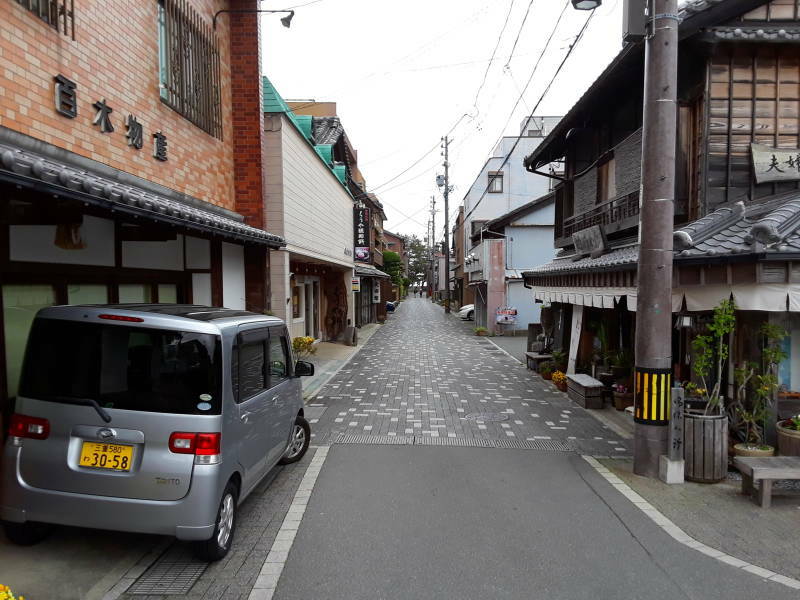 I came here my first morning in Ise. 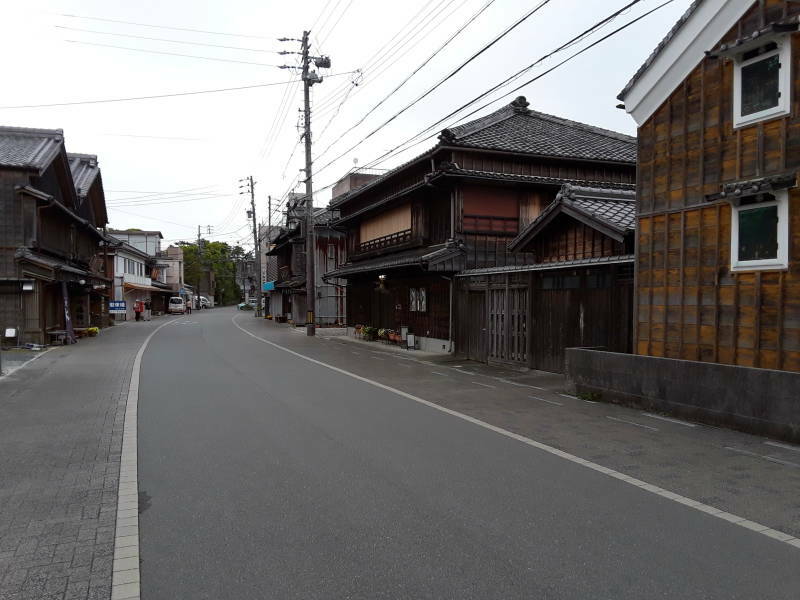 Shintō and the self-identity of Japan date back to the early 8th century CE. That's when the Emperor commissioned the writing of two "histories". The books compiled clan myths and Imperial genealogical legends that had been passed along in oral form. 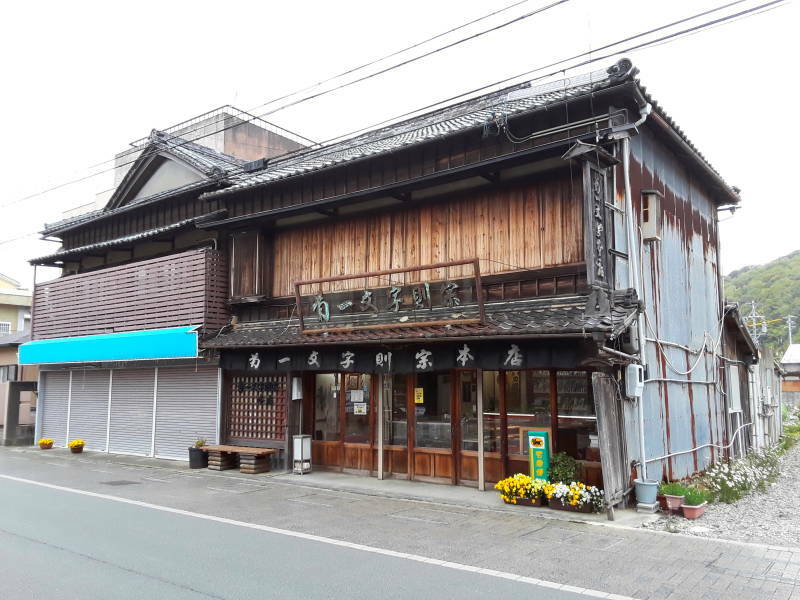 The first of these was the Kojiki (or Records of Ancient Matters), written down in 711-712 CE, and the second was the Nihon Shoki (or Chronicles of Japan), written down about 720 CE. 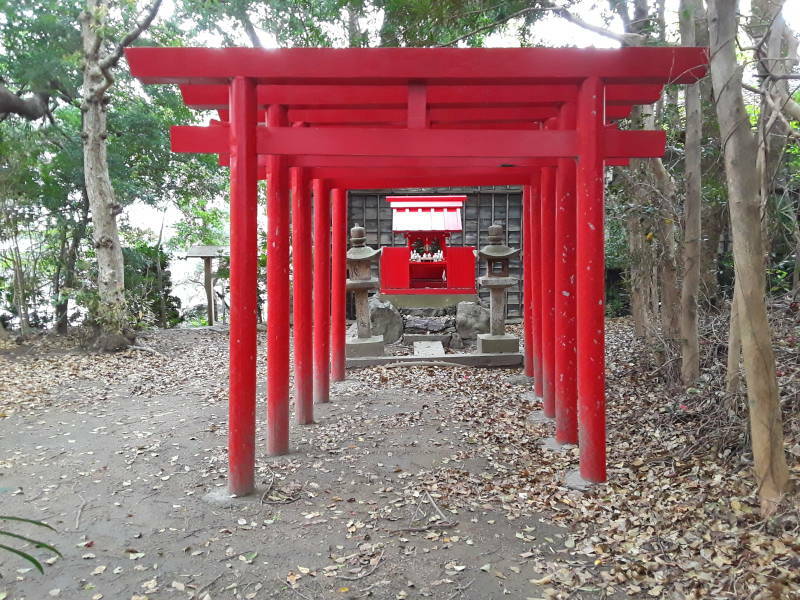 The word Shintō or the "Way of the Kami" was adopted then to describe the spiritual folk tradition. Unlike the corresponding Chinese writings, these chronicles begin before the creation of the world. They maintain an entirely mythological view throughout their description of the early godlike and later heroic human figures. They connect the origin of the Imperial line with the deities before the creation of the world. The very first deities according to Japanese cosmology were Kuninotokotachi and Amenominakanushi, who came into being on their own. Those two created Izanagi and Izanami, who were brother and sister and also husband and wife. Don't be shocked, it was just the two of them back then. They gave birth to the islands of Japan and many of Shintō's deities or spirits, the kami in Japanese. Izanagi and Izanami by Kobayashi Eitaku, around 1885. Izanami died after giving birth to the fire-god Kagu-tsuchi, which would be a rather risky birth. Call the midwife and the firemen. Izanagi killed the fire god, then went to Yomi-no-kuni or the Underworld in hopes of rescuing his sister-wife. Much like Persephone of Greek myth, she was unable to leave because she had eaten food prepared in the Underworld. While cleansing himself after his return, Izanagi gave birth to Ameterasu, the sun goddess, from his left eye; Tsukuyomi, the moon god, from his right eye, and Susanoo, the storm god, from his nose. This was much like Athena emerging from Zeus's head, times three. Amaterasu, also known as Amaterasu-ōmikami and Ōhirume-no-muchi-no-kami, is the goddess of the sun and the entire universe. Amaterasu gave the Sacred Mirror, the Sacred Jewel, and the Sacred Sword to her grandson. He then gave them to his great-grandson, Jimmu, who became the first Emperor of Japan. So, the mythic Emperor Jimmu was described as a direct descendant of these creator gods, just 8 generations down from the primal deities. The genealogy placed him somewhere around 600 BCE. 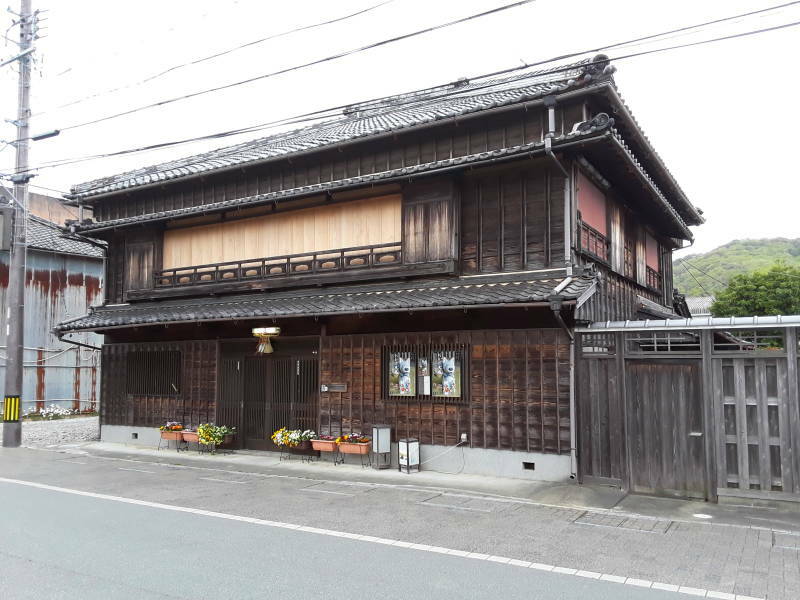 The Kojiki and Nihon Shoki listed Emperors from Jimmu to within a few decades of when they were written down. 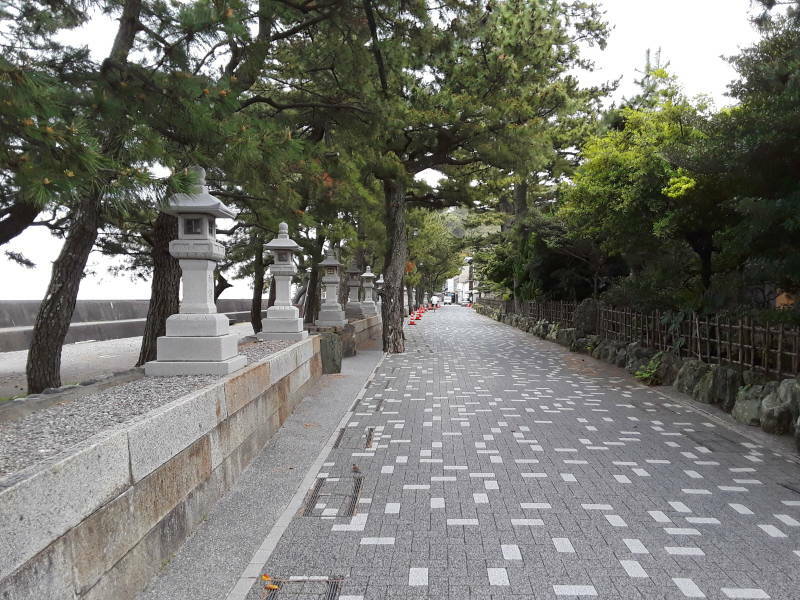 And now I'm on my way to the pair of rocks that represent Izanagi and Izanami, the parents of many of the deities. 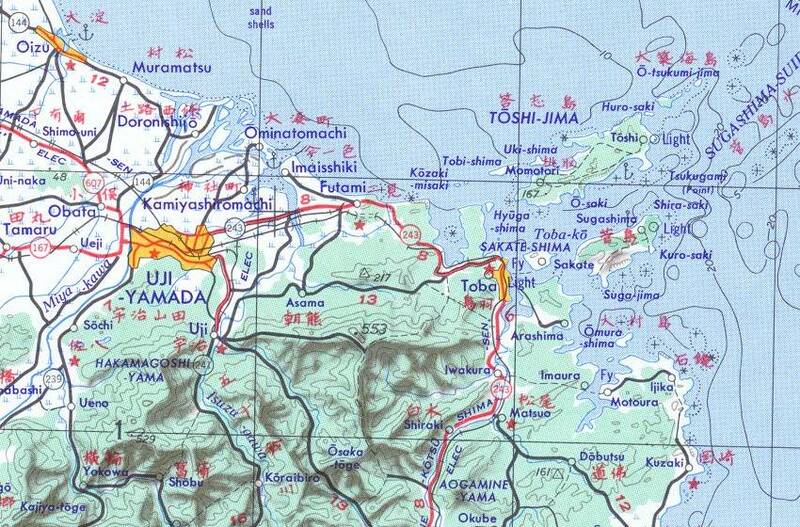 This map from 1953 shows the old official name for Ise, "Uji-Yamada". 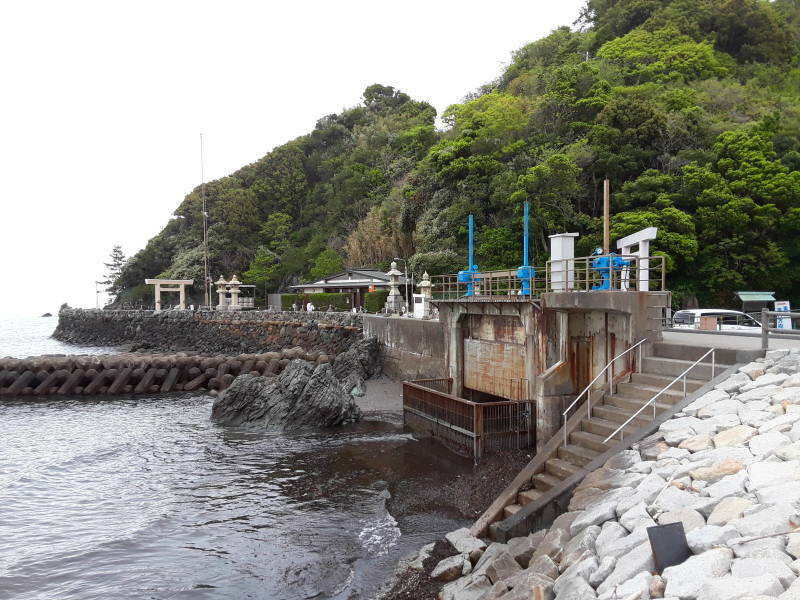 Meoto Iwa is along the coastline just east of Futami. The U.S. Army Corps of Engineers didn't include representations of Shintō deities on this map. 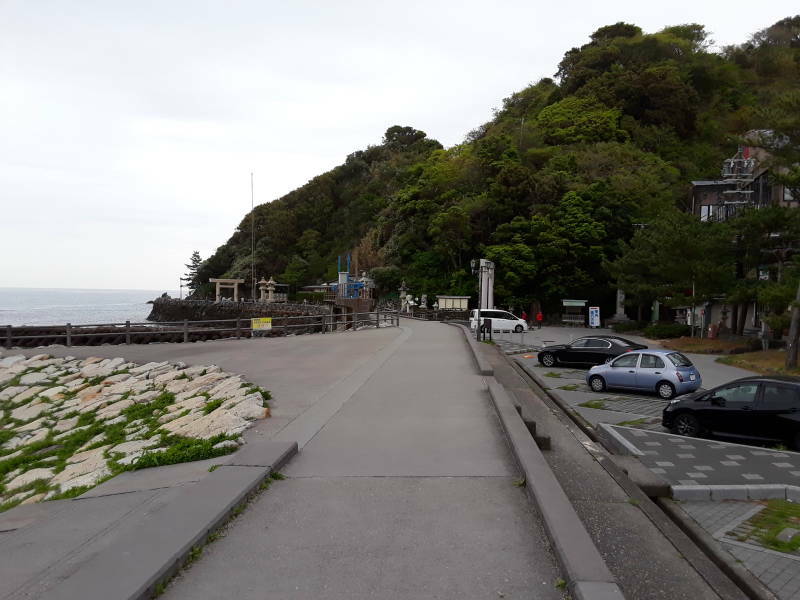 But see the bend in the coastline near what looks like a "+" sign, just to the right of the word "Futami". That's where we're going. This is part of the 1:250,000 map NI 53-8 from the Perry Castañeda Library Map Collection at the University of Texas. 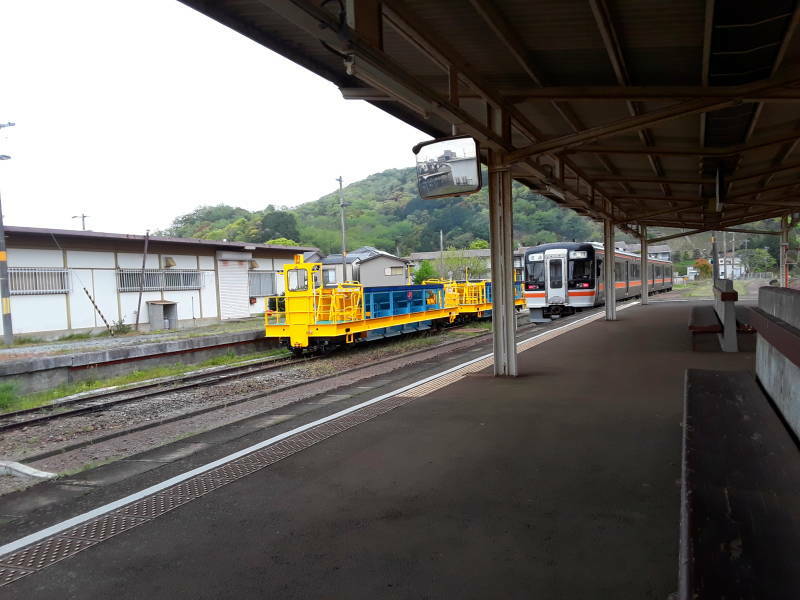 Ise has multiple railroad stations clustered together, operated by separate companies. 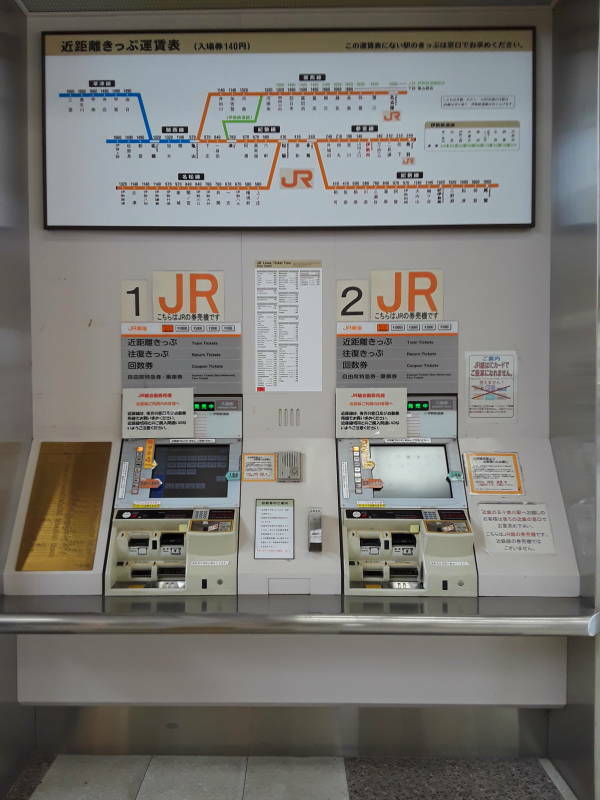 I'll start by going to Ise-shi station to buy a JR Line ticket for the line running toward Toba. 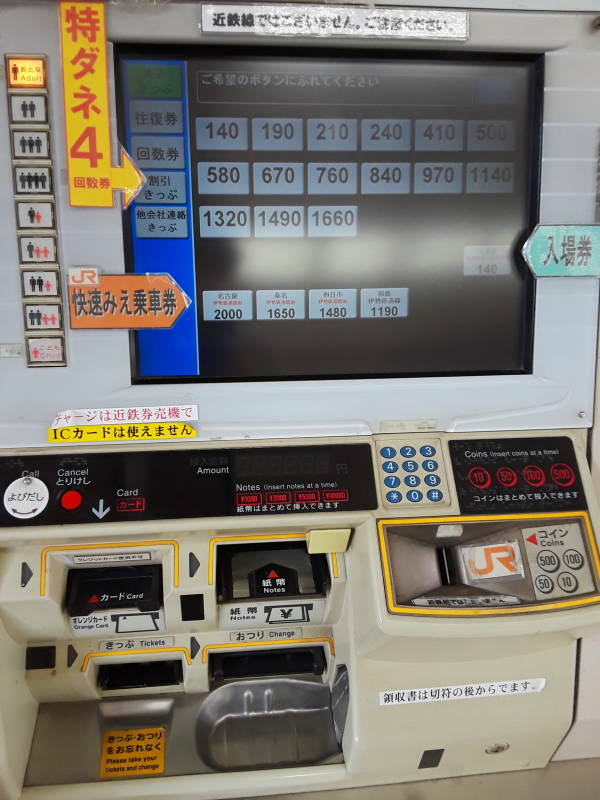 I only need to go two stops, to Futaminoura Station. Just ¥210. 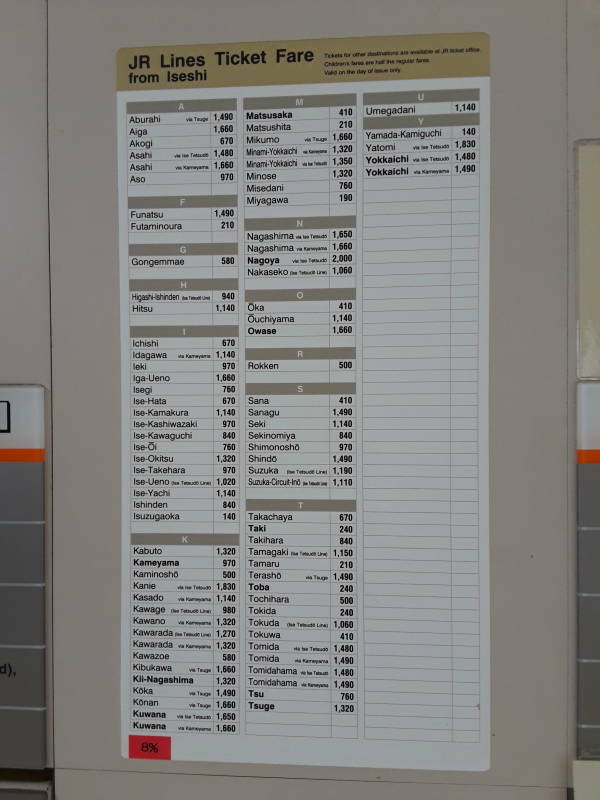 Fortunately for me, there's an English listing near the ticket machine. 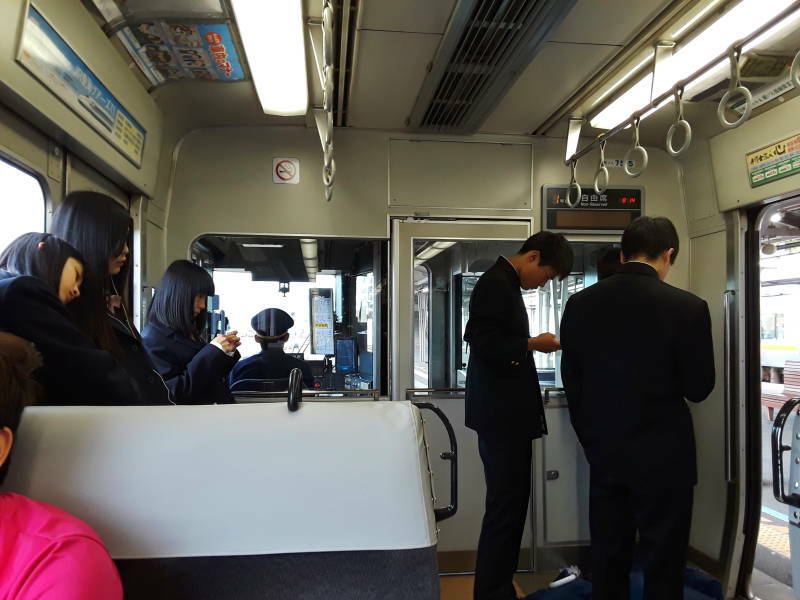 Once on board, everyone is checking their phones as they ride to school. I'll stand in the front and watch the engineer do his thing. 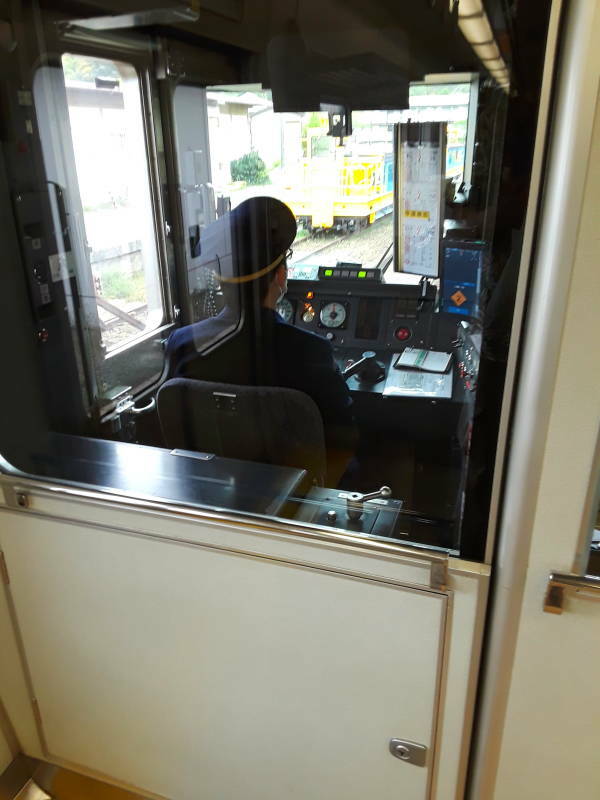 I got off at Futaminoura Station. This is one of the local trains that stops everywhere. 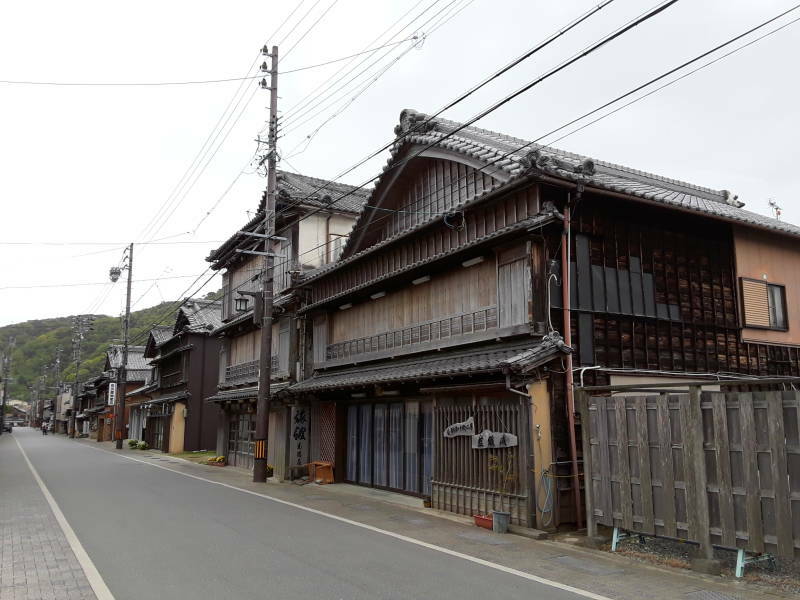 Futaminoura is filled with traditional architecture. 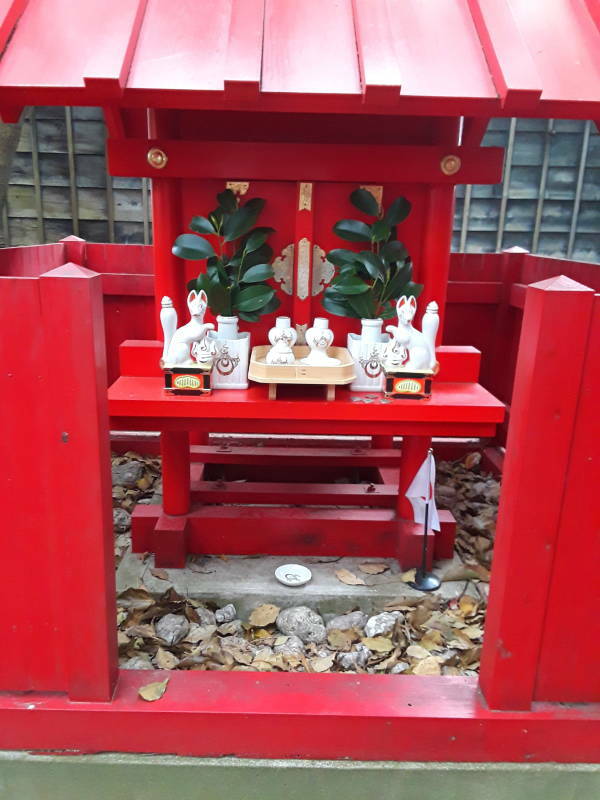 There are small shrines all along the way. 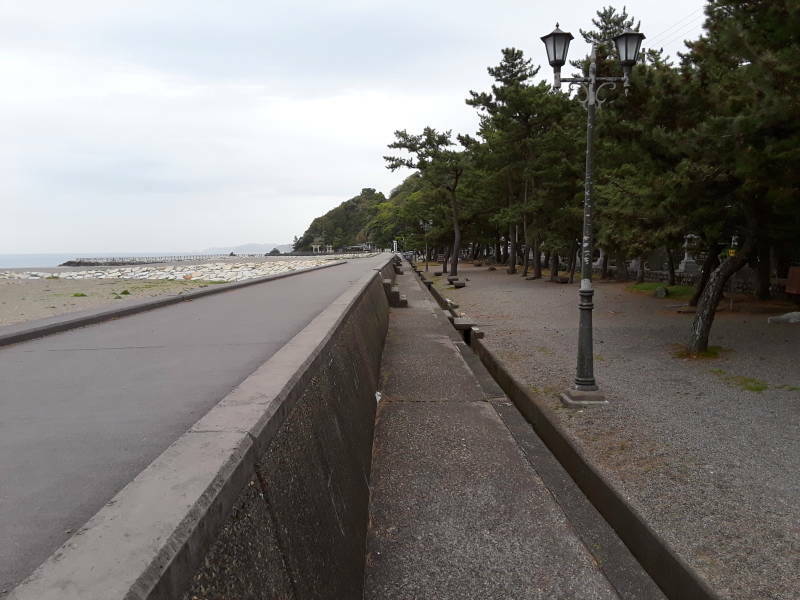 The road nears the beach. 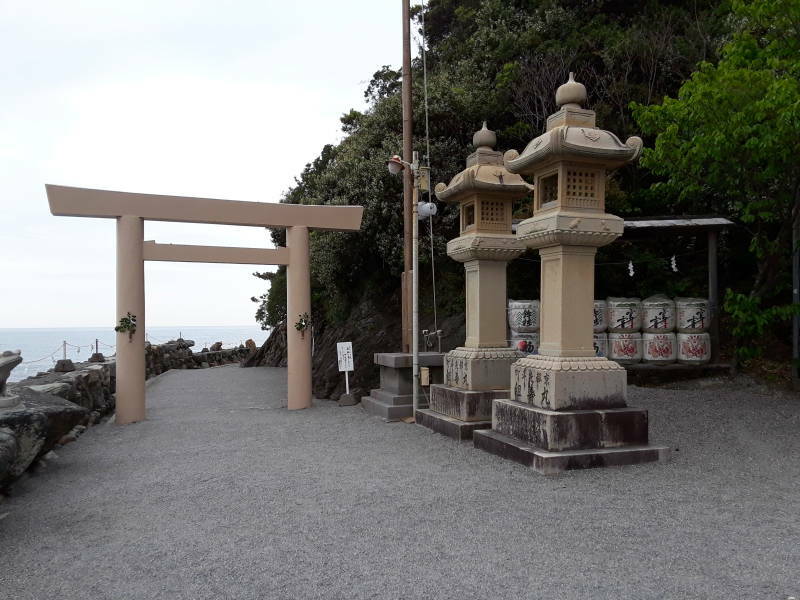 You approach the rocks and associated shrine by a path along the waterline. 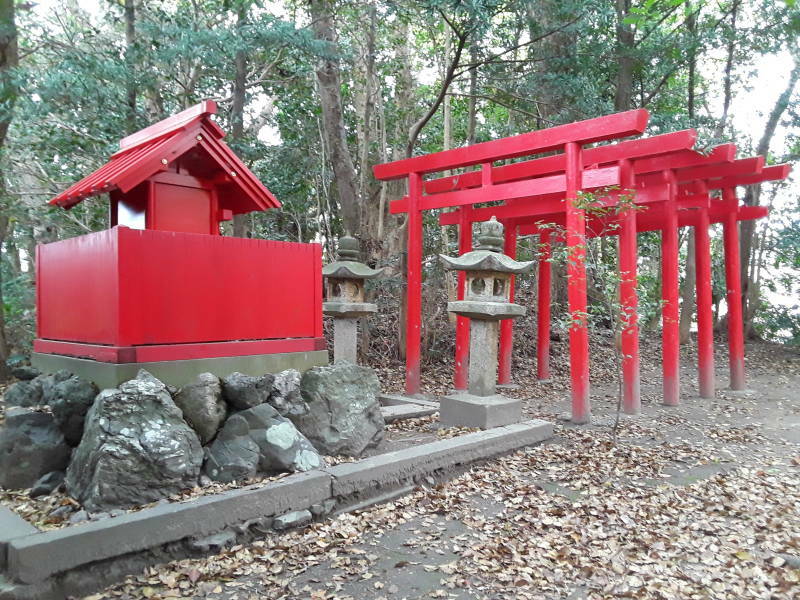 The torii or gates mark passages into increasingly sacred territory. 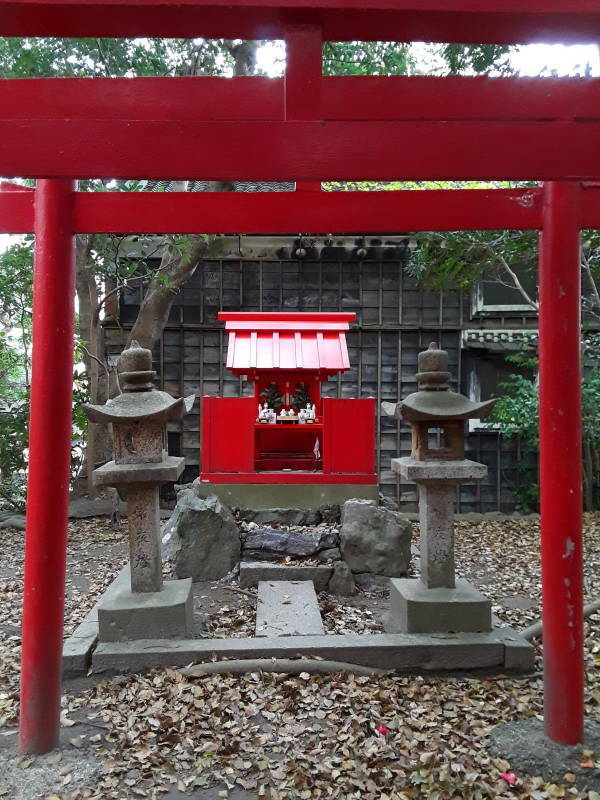 The cylindrical objects to the right of the torii are sake barrels donated to the shrine. 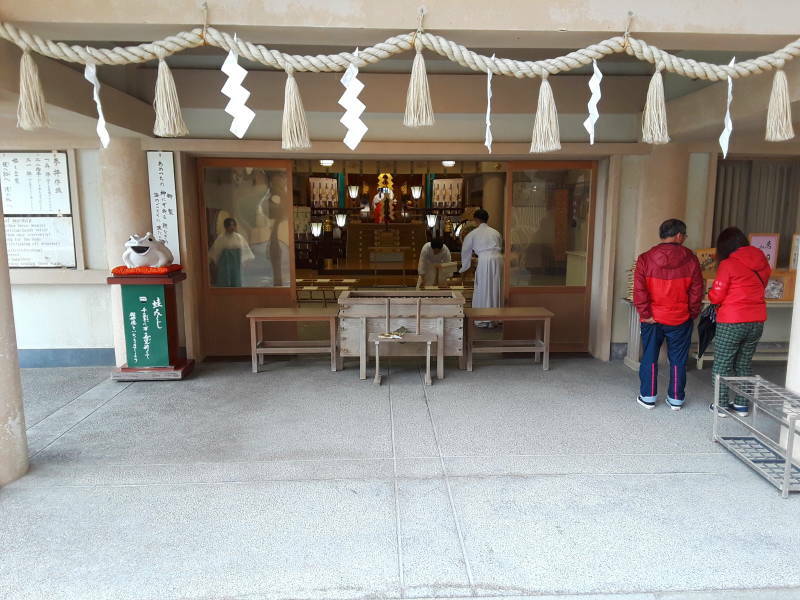 The frogs start appearing as you near the shrine. Things are very batrachian. 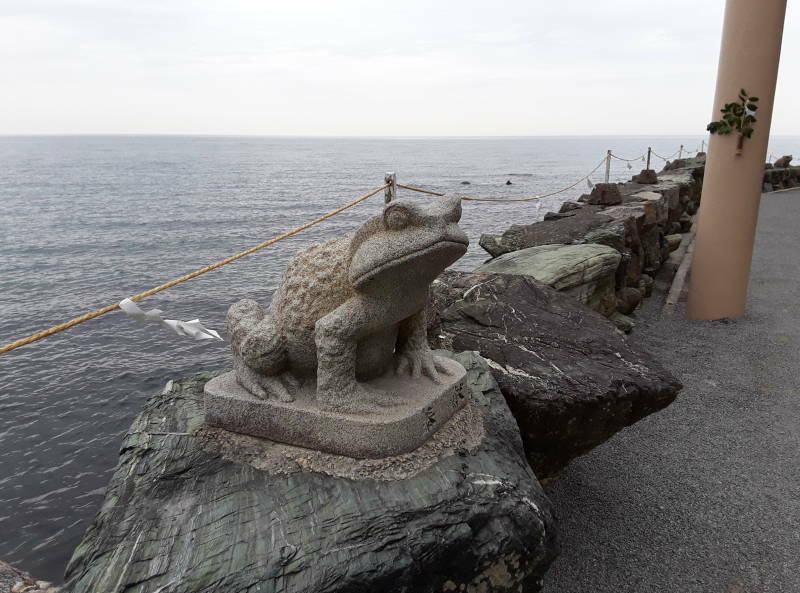 There are frog statues around and in the ablutions fountain. 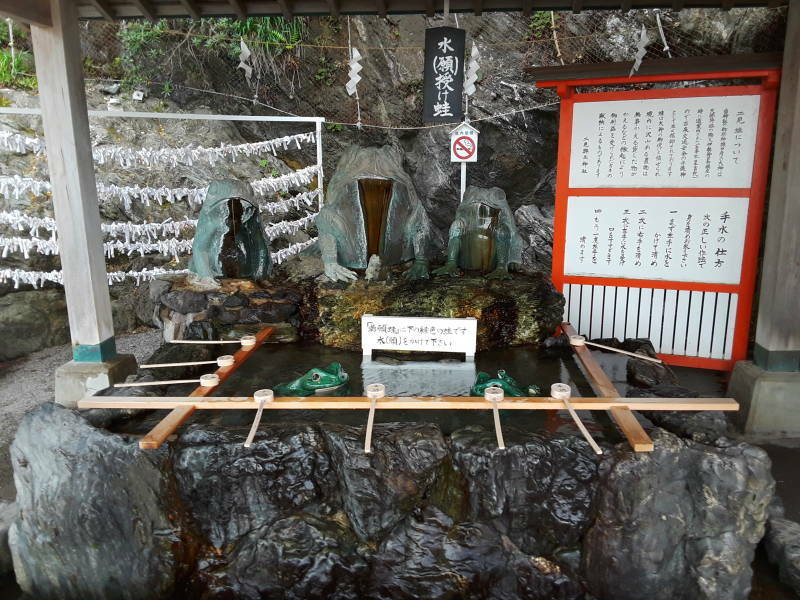 In Shintō the purification rite is temizu, the water reservoir is chōzubachi, and the shelter is chōzuya or temizuya. It's the same concept and the same cleansing ritual in Buddhism, but with different terms. 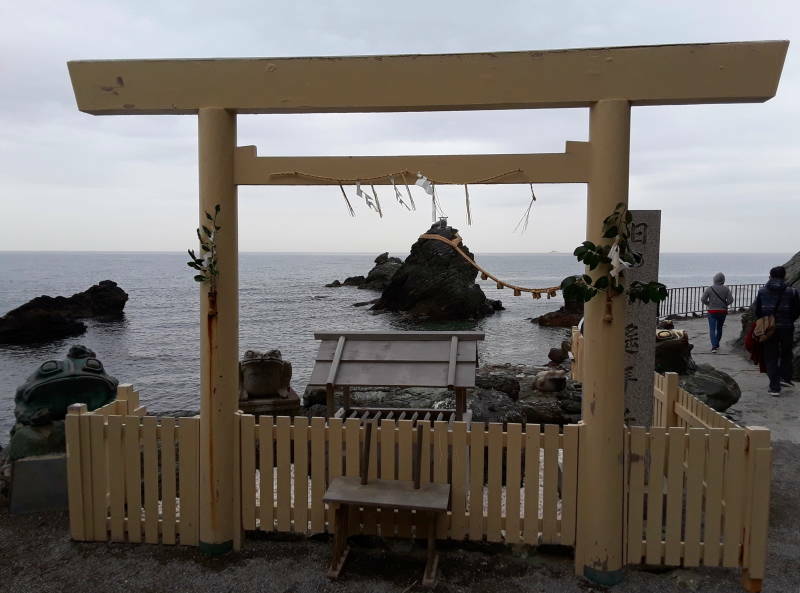 The main shrine at Meoto Iwa is dedicated to Sarutahiko Ōkami, the leader of the earthly kami, and Miketsu or Ukanomitama, the Imperial goddess of food and agriculture. Some priests were preparing for a ritual. Possibly a wedding. In Japan it's very common to have a Shintō wedding and a Buddhist funeral. It happened to be close to low tide when I was there. 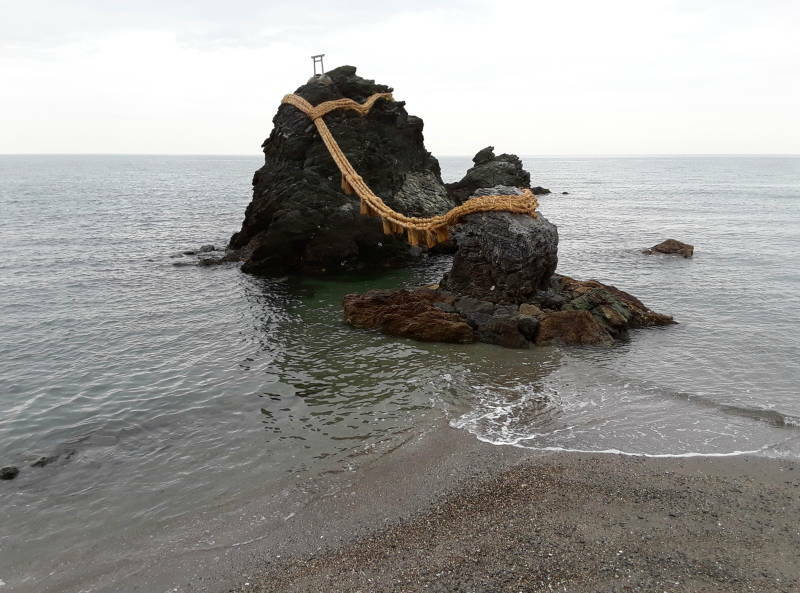 The smaller rock, closer to the shore, is about three meters tall and represents Izanami, the sister-wife. The larger rock, about nine meters tall, represents Izanagi, the brother-husband. The shimenawa is a heavy rope made from rice straw. It weighs over a ton. Several times a year the rope is replaced during a special ceremony. It's always ancient, but always new. Both Shintō and Buddhism explicitly recognize impermanence. We'll really see this in action at the Grand Shrine. 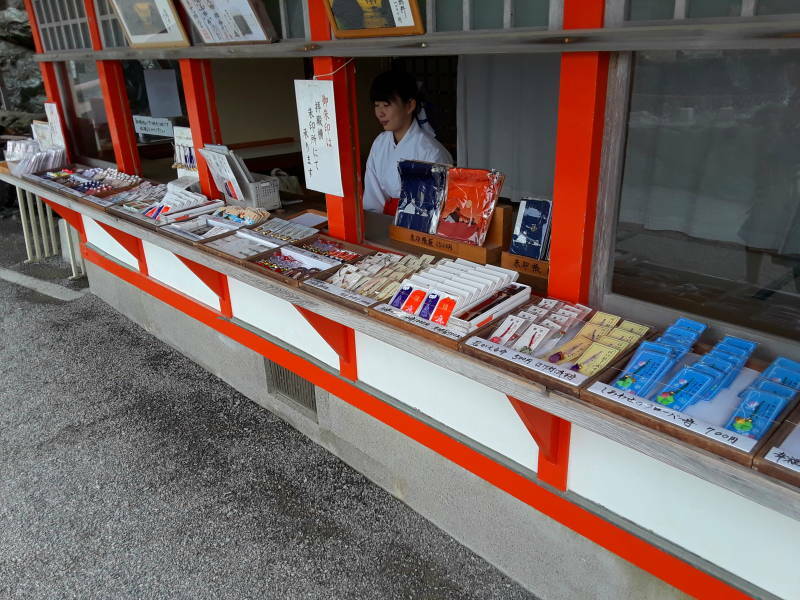 You can buy plaques and ribbons and other devotional and souvenir items. 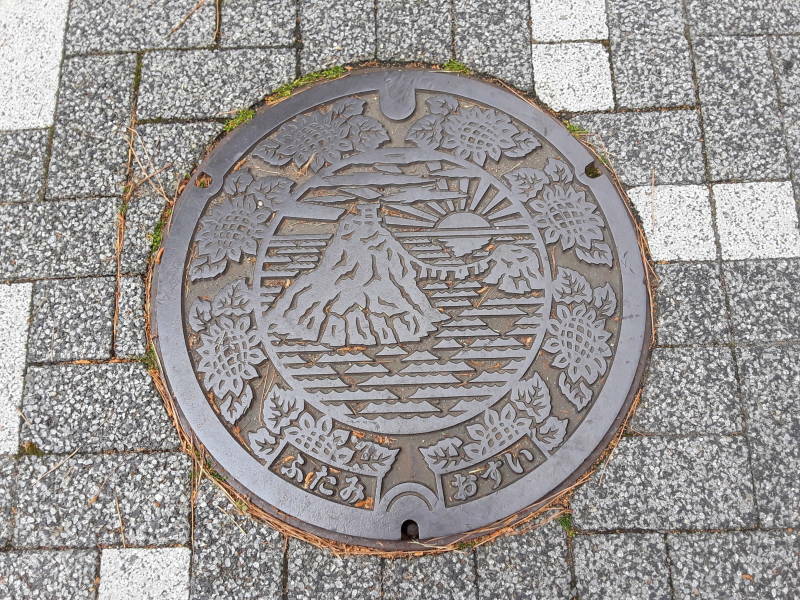 Many cities and towns in Japan have unique manhole covers. 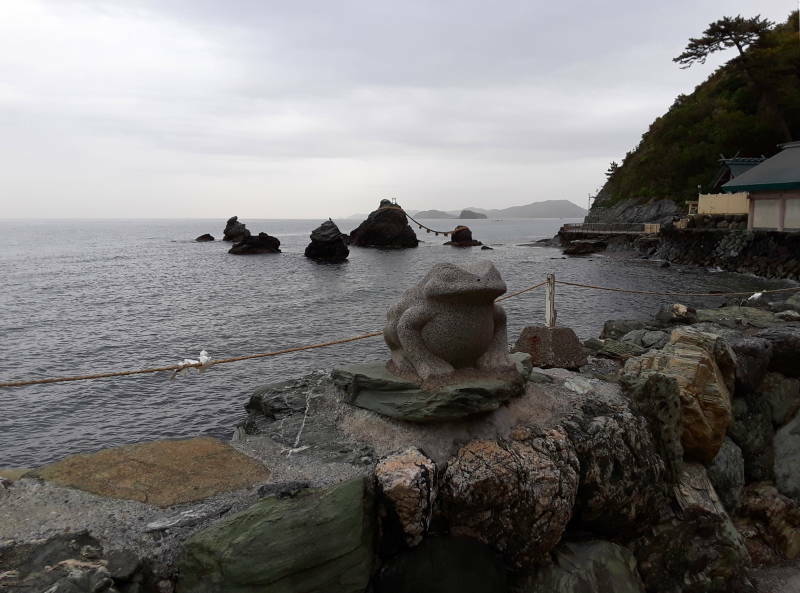 This one commemorates Meoto Iwa. The Hiragana says ふたみ おすい, fu-ta-mi o-su-i. 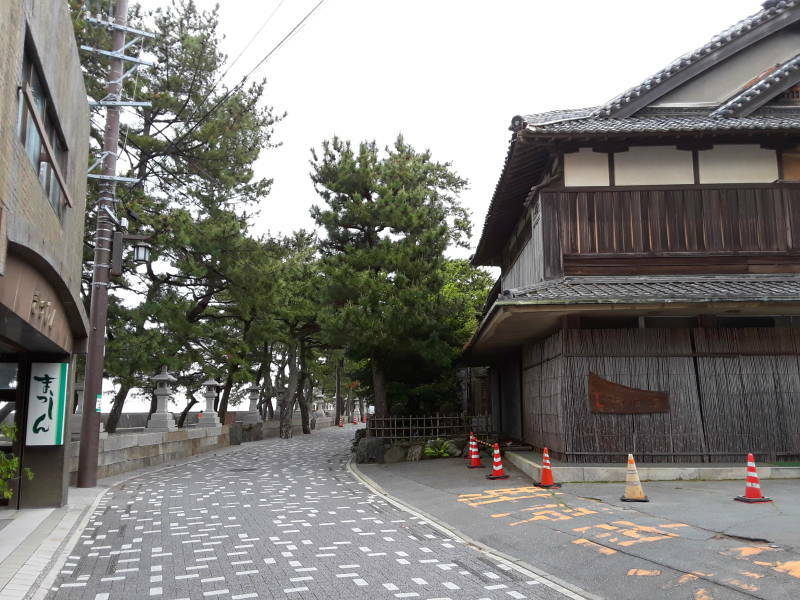 Many place names around here start with "futami-". 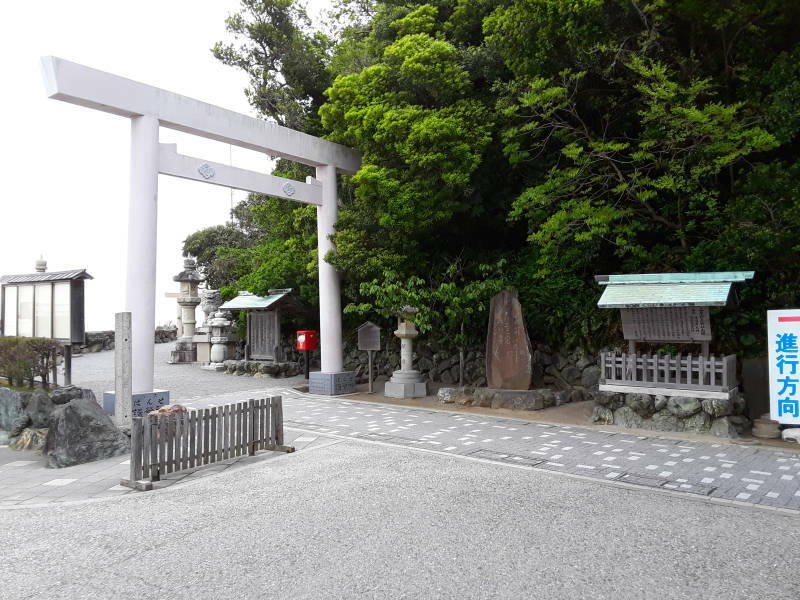 Now that I've seen the representation of Izanagi and Izanami, I'll go to the Grand Shrine of Ise to see the home of Amaterasu, the Goddess of the Sun and the rest of the universe.